Easter is a great time of year, and the perfect excuse to eat lots and lots of delicious chocolatey treats. However, it can get pretty pricey. Easter Eggs don’t come cheap, and it seems as though the price of chocolate rockets in the weeks before the Easter bunny visits. So, instead of worrying about not being able to afford your favourite chocolate treats, why not try making them for yourself? There will be plenty of Easter recipes going up over the next few weeks, but I thought I’d share with you a favourite of mine that is SO easy to make, costs very little, and takes no time at all. If you have kids, this is a great way to get them involved. Or, if you don’t want to splash out on creating anything spectacular this Easter (let’s be honest, who has the time? ), this is the perfect alternative. So, what is it? Well, it’s simply the much-loved Easter Nests. All you need for this recipe is some chocolate of your choice (I used Galaxy because I have lots left over from Christmas, and it’s delicious), some cereal (either Cornflakes or Shredded Wheat, if you want to try something a bit different) and some cupcake cases. If you want to add some extra decoration to your treats, I’d also suggest some mini eggs. For a super simple recipe, all you need to do is melt your chocolate (I’d suggest around 250g for 10-12 nests) either in the microwave or on the hob, being careful not to burn it, and then mix in some cereal, bit by bit, until all of it is nicely coated in chocolate. Then, pop the mixture into some cupcake cases, add your mini eggs to the top, and pop in the fridge for a couple of hours. Done. So, there you have it – a super simple recipe, which takes no time at all but is the perfect treat for Easter time. 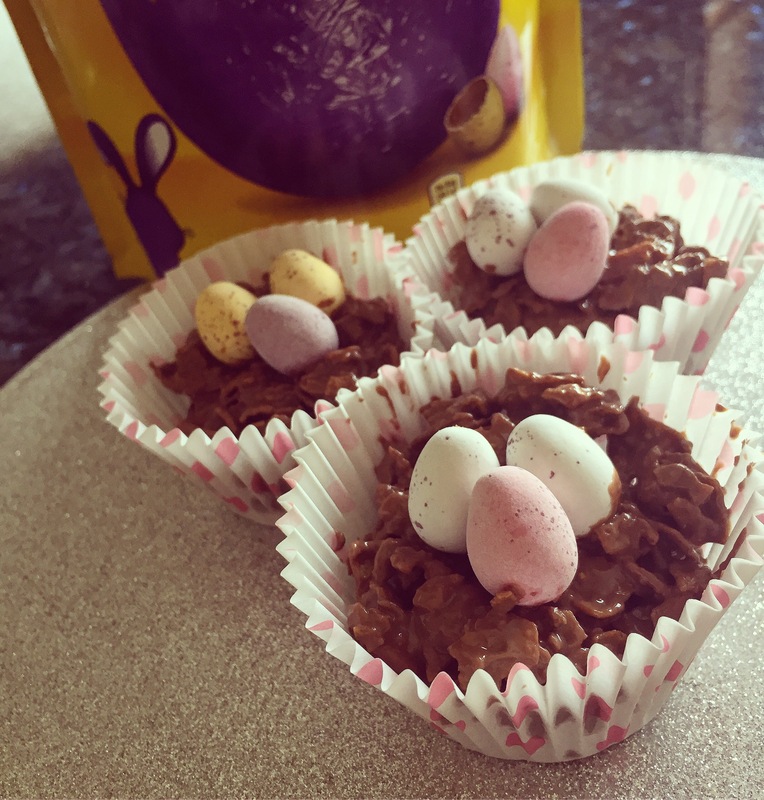 What’s your favourite way to make Easter Nests? Don’t forget to follow, with a new post every day at 6pm during the week, and 1pm on weekend. Good recipe. Short and to the point. Hahah what did you do? !